The Lord's Lass: Operation Clean Out the Closet! Operation Clean Out the Closet! ...*ahem* And this is where the post title comes in. You see, I love to crochet, knit, and sew. Really, I do. But when, at the end of some project, it becomes necessary for me to make an executive decision (do I like the sweater this length, or should I pull it out and make it longer? Is this really the length I want the sleeves? Should I try sewing the edging on in a different way? ), I often solve my dilemma by sticking it in the closet to sit while I "think about it." And...sometimes I start a new project and the old is left collecting dust. And sometimes this means the old project sits there for quite a while. And sometimes this happens multiple times, and I'm left with multiple "old projects." Now, I LOVE this project, and would finish it in a heartbeat, if possible. But the simple fact is, who has the $$ to buy 20-30 skeins of half-silk-half-wool yarn in one sitting? So, I work on it as I can...this may not be completed at the end of summer, but I had to show you! I got this pattern from Fort Vancouver. It was written out by one of the mistresses of a Young Ladies' School in Scotland in the mid-1800s. The reason this project is undone is because I'm not sure how to edge it. I don't know how to pick up the ends and knit an edging, and I'm hesitant to just crochet around it. Hmm...Still haven't decided on a solution yet, but I will by August! 4. Crochet Merino Wool "Swing Jacket"
If nothing else, this post will inform you that I'm always cold, and like wool. :) Dilemma with this lovely pattern? 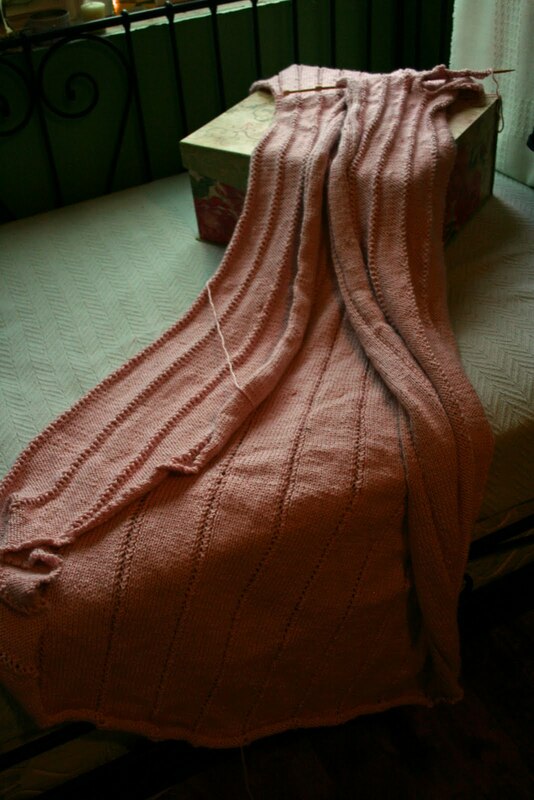 I knit the edging a bit long, knowing it would felt, and planning to simply snip off the extra length. Just to be contrary, the wool didn't felt completely, and I'm consequently a bit wary about this cutting business. Guess I'll have to, though! If it doesn't work, I get to knit another five feet of edging - *groan* - so I hope it works! This is my most pressing of projects, and one for which I didn't have to do any digging. It's a wedding gift for my violin teacher (I missed the wedding while I was in Utah...SO sad), and I am going to a reception in about two weeks, so it is first on the list to complete! Ok, so I really like this project! :) The front of the pillow is crocheted cotton, and for some fun texture-diversity I plan on sewing a satin backing. Procrastination point? I can't decide how I want the flowers! White squares? Green squares? Piled-up in a heap at the center? O-so-lame a reason to not have it finished, I know. But which would you do? And that is Operation Clean Out the Closet! What's on your summer to-do list? This must run in the family! I have three such "works-in-progress" in my closet, too! You do beautiful work, Sarah! Amazing. As for summer plans, I want to read at least one novel in French, visit the Tuilerie Gardens (I have lived near Paris for a year, and haven't been there yet! ), write and practice sharing my testimony in French, find a mentor, and learn to cook rabbit. WOW! That sounds ambitious...And hard :) You have done such a good job on those projects! My favorite is the Bed Jacket. I'm especially in love with the skirt and the bed-jacket...so cute! I can't wait to see them finished and on you, so...hurry up!! As for my summer goals, I was thinking, "huh, I don't have any. I must be really lame." And then I realized, "Oh, yeah--finish college." Duh. No wonder I don't have anything else on my list! Aunt Jen, those are awesome summer goals! You must post a ton of pictures of the gardens when you go - and don't forget to blog about sharing your testimony. That will be an amazing story, I know already! Mika, um...yeah. I think finishing college pretty much counts as a summer goal of monstrous proportions...good luck! All pictures and posts are (c)2011. Picture Window theme. Powered by Blogger.